Discover The Secrets Of Master Prospectors! Long Distance Sponsoring comes with three full hours of step-by-step audio training from nationally successful network marketers...PLUS a 23-page booklet outlining how YOU can harness the power of long-distance sponsoring for yourself. Normally $39.95, you can get this product through SFI for only $32.95 for a CD Set or $29.95 for a downloadable file! REVEALED: * Duplicate your efforts to build a profitable network marketing business. * What you can realistically expect when your purchase home-business leads. * 3 easy steps you can take to combat your fear of prospecting. * The simple art of successful recruiting - locally & nationwide. * The system you may NOT be following, but should if you want to make a profit. Finally...you'll get the secrets of the master prospectors, available in a convenient 2-CD training set or downloadable files. An accompanying 23-page booklet covers lead generating tips, prospecting advice, scripts used by the industry pros to generate RESULTS, and more! About Cutting Edge Media (CEM): Serving small- and home-business owners since 1991, CEM has risen through the ranks to become the definitive "total prospecting solution" company for network marketers and direct sales professionals around the world. IMPORTANT! Because of the nature of this product, SFI cannot accept returns or issue refunds for Long Distance Sponsoring. Discover The Secrets Of Master Prospectors! 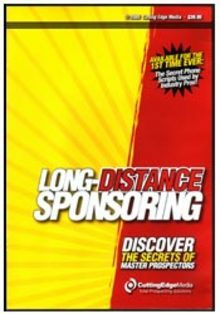 Long Distance Sponsoring comes with three full hours of step-by-step audio training from nationally successful network marketers...PLUS a 23-page booklet outlining how YOU can harness the power of long-distance sponsoring for yourself. Normally $39.95, you can get this product through SFI for only $32.95 for a CD Set or $29.95 for a downloadable file! * Duplicate your efforts to build a profitable network marketing business. * What you can realistically expect when your purchase home-business leads. * 3 easy steps you can take to combat your fear of prospecting. * The simple art of successful recruiting - locally & nationwide. * The system you may NOT be following, but should if you want to make a profit. Finally...you'll get the secrets of the master prospectors, available in a convenient 2-CD training set or downloadable files. An accompanying 23-page booklet covers lead generating tips, prospecting advice, scripts used by the industry pros to generate RESULTS, and more! About Cutting Edge Media (CEM): Serving small- and home-business owners since 1991, CEM has risen through the ranks to become the definitive "total prospecting solution" company for network marketers and direct sales professionals around the world. IMPORTANT! Because of the nature of this product, SFI cannot accept returns or issue refunds for Long Distance Sponsoring.